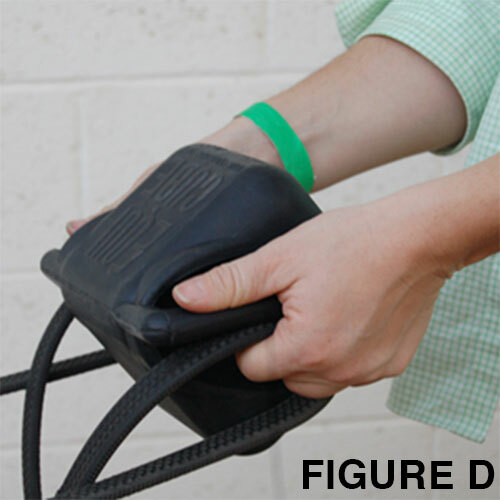 1The Equicube is held in front of you in the saddle and just high enough so it does not touch your horse. 2Relax your shoulders and let them drop down into their sockets. 3Your upper arms should drape down your sides, staying close to your sides at all times. 4The weight of the Equicube should be supported in your back, engaging your latissimus dorsi muscle. 1Pick up your reins and add the handle of the cube with thumbs positioned resting lightly on the top of the handles, as seen in the photo. 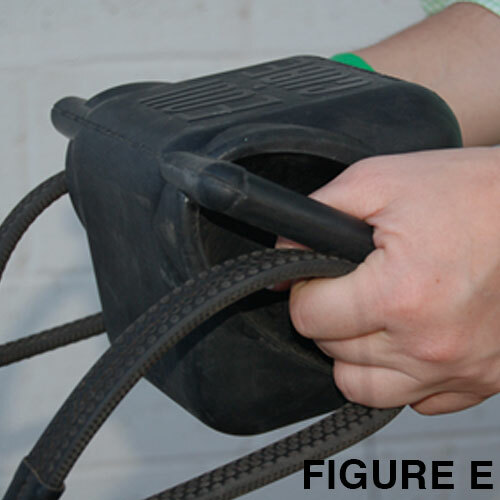 2Once the Equicube is level, shorten the reins so you feel you have contact with the bit in your horses mouth. 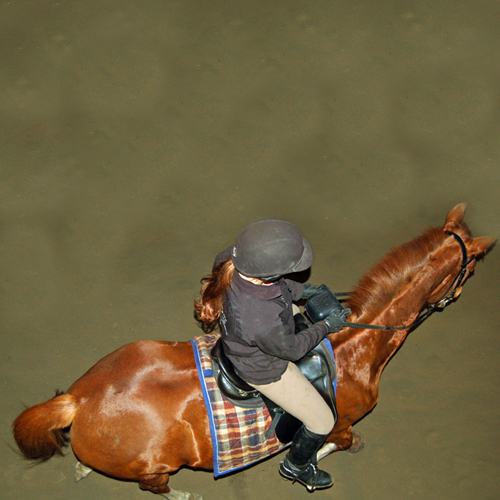 The reins may have to be a bit shorter than normal because of your hand position. 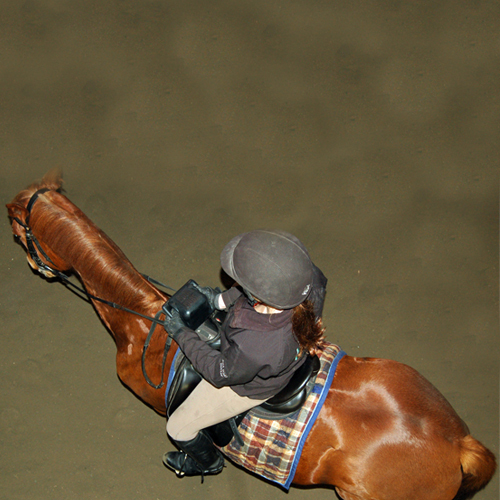 As you begin to move, the top flat surface of the Equicube should remain level at all times and in all gaits. 1Place the Equicube in your hands, with the logo facing you. 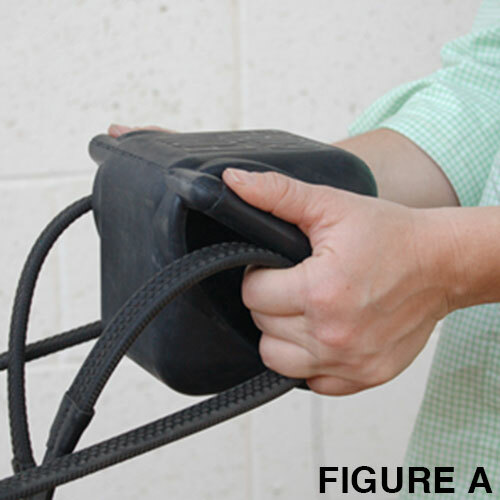 Pick up your reins and add the handle of the cube on top with thumbs positioned. 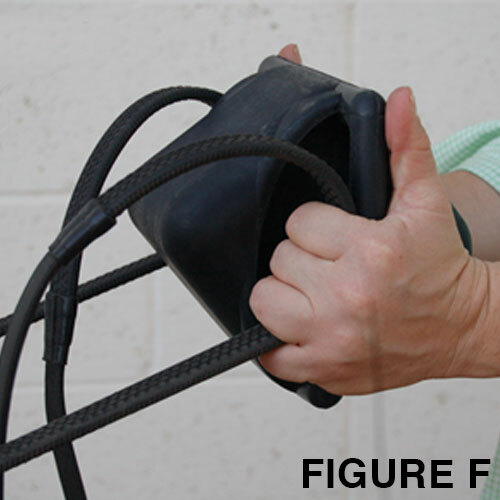 Figure A shows the proper placement of your hands, with the thumbs on top of the handle, and reins gripped below the handle. In Figure B, the rider holds the cube level, with elbows at her sides. 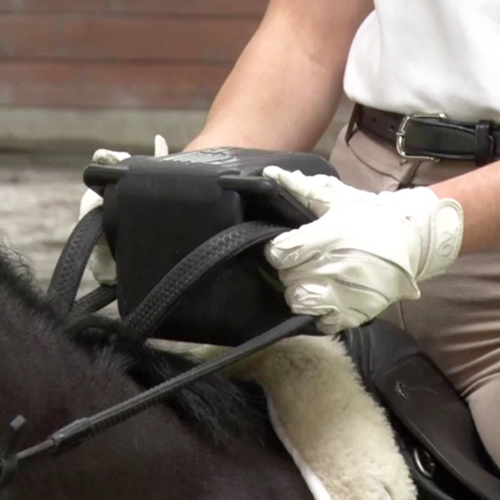 Figure C shows proper grasp on the Equicube prior to the addition of reins. 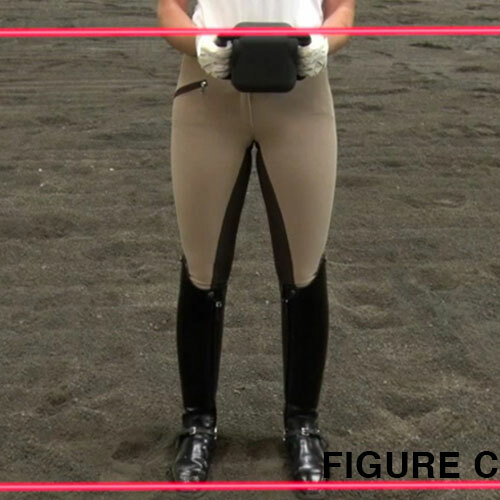 If the Equicube does not remain level, (flat surface parallel to the arena floor), proper core engagement is not achieved due to increased tension in hand and forearm, which decreases recruitment of the core muscles. Figures D, E, and F show common errors while riding with the Equicube. Make sure the Equicube is always pointed in the direction you are going. With your elbows staying down at your sides move the Equicube the direction you want to go by turning your torso. In all gaits and in all movements this rule remains the same. 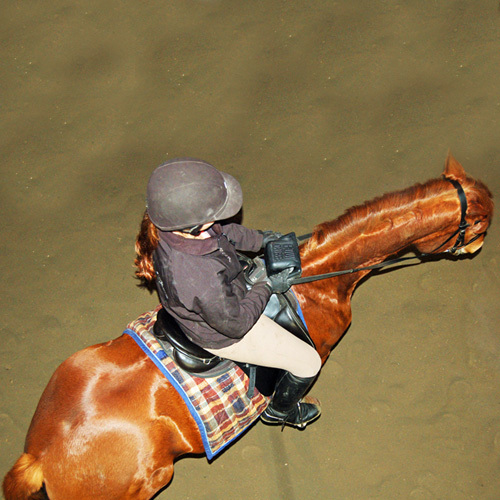 1The same methods used for flat work are used when jumping with the Equicube. Practice in all gaits on the flat prior to jumping with the Equicube. 2Once you are comfortable with the Equicube on the flat, move up to trot or canter poles and cross rails. 3Your weight should be strongly down into your leg, heels under your seat and down. If it feels like the Equicube is pulling you forward, either your weight is not staying down into your heels or you are not using your back muscles to support the weight of the Equicube. 4Keep your weight balanced over your leg and your core strong as you are following the motion over the fence.